Slice eggplant into approx. 1-cm/0.5-inch. slices, finely dice onion, and mince garlic. Salt eggplant slices on both sides, spread out on paper towels, and set aside for approx. 20 min. In the meantime, wash and scrub potatoes and boil skin-on for approx. 15 min. over medium heat, then set aside. Heat oil in a pot over medium-high heat, add ground lamb and sauté for approx. 3 min. until browned, then add chopped onion and garlic. Add tomato paste and canned tomatoes. Stir to combine and season with salt, cumin, rosemary, and cinnamon. Turn heat down to low and leave to simmer for approx. 50 min. Preheat oven to 200°C/400°F. In the meantime, pat eggplant dry with paper towels. Heat oil in a frying pan over medium-high heat and fry eggplant slices until golden brown on both sides. Transfer to a plate lined with paper towels to drain briefly. To make the béchamel sauce, melt butter in a saucepan over medium heat. Sift in flour and stir continuously into a paste. Once it begins to bubbles, reduce heat to low and gradually add milk while whisking. Whisk vigorously until sauce becomes smooth, then leave to simmer for approx. 3-4 min., until thickened. Remove from heat and whisk in egg. Season with nutmeg, salt, and pepper to taste. Grease a large baking dish. Cut potatoes into thick slices, distribute in an even layer in bottom of baking dish, and lightly salt. Add a layer of eggplant on top, then the meat sauce, sprinkle with cheese, and pour béchamel sauce on top. 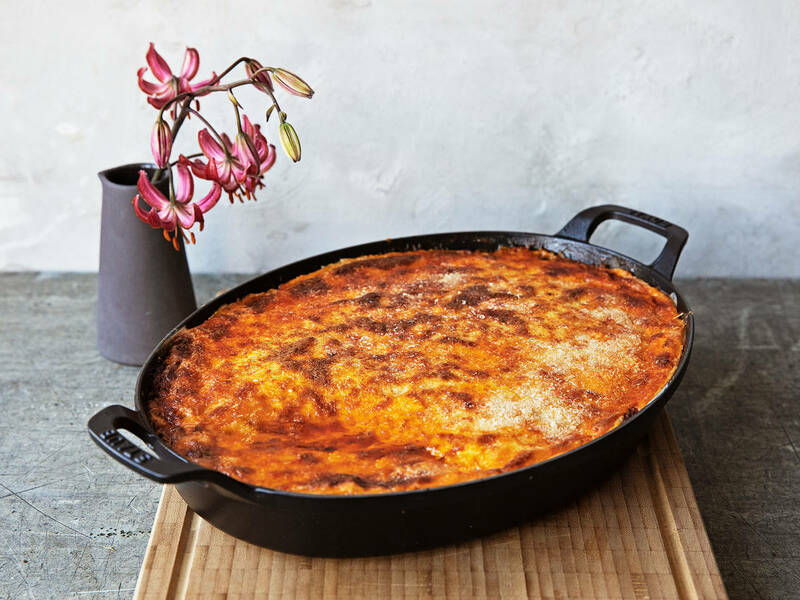 Bake moussaka in a preheated oven at 200°C/400°F for approx. 45 min, or until the top is set and speckled brown. Remove from oven and let cool slightly before slicing. Enjoy!